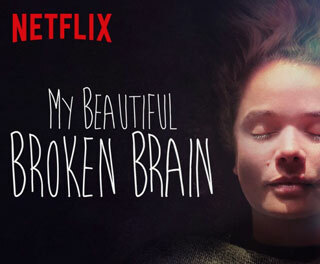 If you are looking for an uplifting movie to watch this weekend, then you don’t want to miss My Beautiful Broken Brain, a Netflix original documentary about a young woman who suffers a stroke and finds out what it takes to live with aphasia. Lotje Sodderland is a 34-year-old woman living in the United Kingdom. A happy and successful film producer, her entire life changed overnight. She awoke one morning disoriented and with an excruciating headache. After stumbling across the street to a nearby hotel, she was found unconscious in the lobby bathroom. Lotje suffered an intracerebral brain hemorrhage. She was rushed into surgery to remove the blood clot, but the damage was done. She was diagnosed with aphasia with limited speech and an inability to read or write. In uncharted territory, she turned to what she knew best — making films. My Beautiful Broken Brain follows Lotje throughout her recovery journey and beautifully captures her struggle to accept her new reality after her stroke. This documentary is an inspiring story of hope, persistence, and one woman’s refusal to let aphasia hold her back. My Beautiful Broken Brain is available on Netflix.